UPDATE: Wow. To those who think the Oscars have become to predictable welcome to Oscar Night 2016. There were many surprises! Who exactly saw Spotlight winning Best Picture (and only one other Oscar)? Certainly not me. I figured if any film would take down "The Revenant" it would be "The Big Short." But you know what? It makes sense that "Spotlight" would win, further proof that figuring out the preferential ballot is the key to predicting Best Picture. (Not to mention that pesky SAG ensemble award stat that made a win for Spotlight or The Big Short pretty inevitable). It's not quite as cut and dry as "the movie with the most wins will also win Best Picture." That just doesn't happen very much any more. It's also the first time in the era of the preferential ballot that the PGA failed to predicted the eventual Oscar winner. Ex Machina pulled a shocking upset in the Visual Effects category (deservedly so) becoming the first non-best picture nominee to win against best picture nominees since 1970. And poor Sylvester Stallone, always a bridesmaid, never a bride. Maybe Mickey Rourke bought him a drink. Because of the unpredictably of the awards many folks, myself included, didn't fare too well with their predictions. I missed eight bringing my count to 16 out of 24, my worst showing since... last year. See you next year. Oy vey. What a frustratingly difficult Best Picture race it’s been. It’s as stressful as it is exciting for someone like me who looks forward to predicting these awards year after year. Usually one film dominates in the precursor awards leading up to the Oscars. Even if it’s only a two way race one can usually figure out the most likely winner (like last year’s Boyhood vs. Birdman dog fight). Now we have three movies vying for the top spot, but in the last few weeks it’s been made pretty clear that there actually is finally sort of a frontrunner. Let’s get into it. Who Will Win: “The Revenant.” I’m definitely not 100% confident in this pick but considering everything that has happened in the last couple months it feels like the most likely victor. The three way race I mentioned above basically comes down to “The Revenant” vs. “The Big Short” vs. “Spotlight.” Each film could make an argument about them being the likely winner. There are also enough arguments against each movie. “The Big Short” won the PGA award, whose voters use the same preferential ballot used by the Academy. The PGA winner has gone on to win Best Picture at the Oscars EVERY SINGLE YEAR since 2006 when “Little Miss Sunshine” lost the Oscar to “The Departed. Also, of note that since the Academy expanded Best Picture beyond five nominees the PGA has never been wrong. The closest they came to getting it wrong was that inexplicable tie between Gravity and eventual Oscar winner 12 Years a Slave. It’s hard to argue with statistics. Which is why “The Big Short” does sort of make sense as a winner. But if it wins what other categories would it win? I can’t see much else beyond Adapted Screenplay. Perhaps editing? No movie has won Best Picture and one other Oscar since “The Greatest Show on Earth” in 1952. Ditto “Spotlight” a movie poised as an early frontrunner (especially having won the SAG ensemble award) who doesn’t seem to stand a chance with winning much else. Both of these movies have a realtively small number of total nominations compared to “The Revenant’s 12. If Innaritu is gonna make history by becoming only the third director to win back to back directing Oscars why not make history by being the first person to direct back to back Best Picture winners? Also working against “The Revenant” is its lack of a screenplay nod (though Titanic and The Sound of Music had no problem with that) and its lack of a SAG Cast nomination would make it the first movie since Braveheart to win Best Picture without that significant nomination. Now that I’ve pulled all my hair out I’ve decided to not split director & picture and go with my gut: It’s saying Revenant. Case closed. Who Should Win: “Mad Max: Fury Road.” It’s my favorite movie of the year so yeah. The only Best Picture nominee I’m not a fan of is “The Big Short” so basically I can’t complain about this year’s nominees. Will Win: Alejandro G. Inarritu, “The Revenant.” Déjà vu. Didn’t he just win last year for “Birdman?” I didn’t really think it could happen but the DGA has spoken. I guess if someone else were to win win it’d probably be George Miller. Though, if The Big Short were to win Best Picture, wouldn’t Adam McKay make more sense? Should Win: George Miller, “Mad Max: Fury Road.” I wouldn’t hate it if any of the nominees won. Inarritu did another fantastic job in a completely different type of directorial achievement, but he won last year. Miller, however, crafted such a dizzyingly fantastic action spectacle – at age 70 – that you have to just stand back and marvel in it all. It’s a movie that could have failed miserable but it’s weird, awesome, and breathtaking. Will Win: Leonardo DiCaprio, “The Revenant.” I’m pretty confident the lead acting races are all sewn up. If Leo somehow manages to lose yet again, I hope he chucks bison liver at everyone. Should Win: Leonardo DiCaprio, “The Revenant.” Sure, he should have won for “The Wolf of Wall Street,” but Matthew deserved it as well. I still don’t believe this is in any way just a “make up” Oscar. He’s fantastic in the film. If anyone else deserves it I’d probably go with Michael Fassbender. Will Win: Brie Larson, “Room.” “Room” is an amazing achievement and Brie Larson is amazing in it. She’ll take this one. I’d be genuinely shocked if anyone else won. Should Win: Brie Larson, “Room.” She - and her young co-star - give riveting performances. Will Win: Sylvester Stallone, “Creed.” This category usually acts as a “veteran’s achievement award” (just ask Michael Caine, Christopher Plummer, Alan Arkin, George Clooney, etc) which is why I think the Oscar-less Stallone will get the sentimental vote. And maybe the Academy will feel less racist voting for the movie Creed, even if a white guy will be the only benefactor. 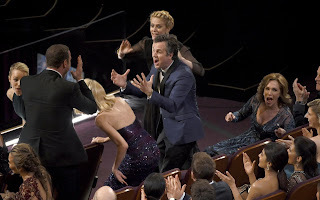 This will also be an interesting category to watch because a win for Mark Ruffalo or Christian Bale would show tremendous support for their respective Best Picture frontrunners and could signal where the night is headed in terms of the big prize. Heck, Hardy could shock everyone since he hasn’t had a chance to compete with these other actors since his nomination was a relative surprise. Should Win: Sylvester Stallone, “Creed.” It helps that Stallone is actually very good and affecting in “Creed.” To take this character that he’s lived with for decades and still make him, interesting, fresh, and relevant is certainly an achievement and is certainly the heart of the film. I also wouldn’t hate it if Tom Hardy won. Will Win: Alicia Vikander, “The Danish Girl.” This is sort of a tough one since the supporting races are not nearly the lock they were last year, but I’m feeling pretty confident about this one. Vikander has previously won for “The Danish Girl” every time she’s been nominated in this category, Winslet has won every time Vikander has been nominated for “Ex Machina.” I think the fact she gave two great performances this year and Kate won before that Vikander is the odds on favorite here. Should Win: Jennifer Jason Leigh, “The Hateful Eight.” I’d love to hear Kate Winslet’s name called if only so that a) Leo and Kate could win on the same night and b) to hear just a brief bit of the amazing “Steve Jobs” score. The one who really deserves it is Leigh who stole the entire movie away from the entire male cast. 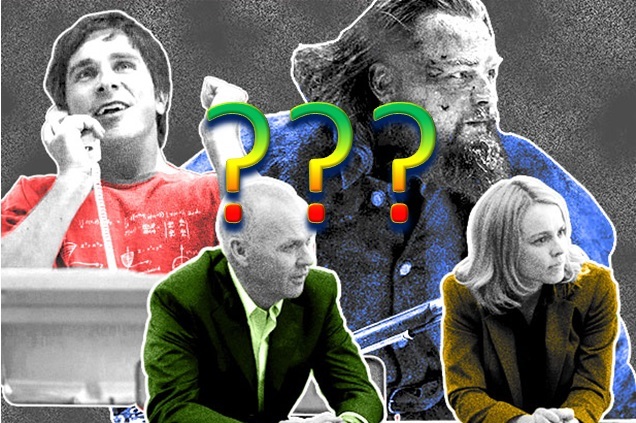 Will Win: “The Big Short.” Since “Steve Jobs” isn’t here, “The Big Short” just has to win. If it can’t even win this there’s no way it can take the top prize. I feel like “Room” or “The Martian” could be the only potential spoilers, but barely. Will Win: “Spotlight.” If it can’t even win here there’s no way it can take the top prize. I wonder if “Straight Outta Compton” could get some #OscarsSoWhite sympathy votes (even though all of the writers are white people)? Will Win: “Inside Out.” Is there a bigger lock of the night? Especially with other not-nominated Pixar film “The Good Dinosaur” unable to take away potential votes. Will Win: “The Revenant.” Just last year I was talking about how an amazing achievement it would be for Lubeski to win back-to-back Cinematography Oscars… make that back-to-back-to-back Oscars. And poor Roger Deakins still doesn’t have any. Will Win: “Cinderella.” This category is gonna give me angina. Historically speaking, “Cinderella” is the most obvious and likely winner. But most people are predicting “Mad Max’s” post-apocalyptic threads to prevail. That just doesn’t seem right with me. None of this year’s nominees are overly flashy which is why a win for “Cinderella” just makes sense to me, so I’m sticking with it (This category also has a strong connection with Production Design – formerly Art Direction – so a win for Mad Max would make sense since it’s the PD frontrunner). Will Win: “Son of Saul.” It has to do with the Holocaust. Next? Will Win: “Mad Max: Fury Road.” I’m pretty confident this movie has it in the bag. Will Win: “The Hateful Eight.” The Academy loves awarding people who have never won this before (unless your name is Thomas Newman, apparently) so I think the Academy will award composing legend Ennio Morricone with his first competitive Oscar win for his haunting score. Will Win: “Mad Max: Fury Road.” I’d genuinely be surprised if anything else won. Will Win: “World of Tomorrow.” This is such a weird, bizarre and purposely crudely animated film that part of me thinks the Academy won’t go for it. You could go with the popular vote and put down the Pixar film but that haven’t won in a while and Sanjay isn’t nearly as good as some of their previous efforts. “Bear Story” has lots of buzz but I’m going with the more “out there” choice (besides, it’s been on Netflix for a while so I assume it must be one of the more widely seen films). Will Win: “Shok.” This short categories are always a nightmare to predict. I’ve heard “Ave Maria” and “Stutterer” may be too “light” and I’ve heard “Shok” is extremely powerful if a tad dark. Who knows! Will Win: “Mad Max: Fury Road.” I’m always hesitant to just go down the sheet and put one film winning all these tech awards. Sure Gravity pulled off seven wins a couple years ago but that was also a front runner for Best Picture. Does the Academy really love “Mad Max” as much as everyone assumes they do? You can’t help but agree the cool sound effects in “Mad Max” –which is essentially a long car chase – would make sense winning this category but then there’s…. Will Win: “The Revenant.” I think because of the unique way “The Revenant” was filmed will do wonders for some of these tech categories and I wouldn’t be surprised to it take both Sound categories. These two categories rarely split and predicting those splits can be tricky. Hopefully I don’t have this backwards. If one film wins both awards at least I'll be half right. I also at least understand what these categories mean more than most of the actual Academy members. Will Win: “Mad Max: Fury Road.” This award has gone to a Best Picture nominee (when there is one) since 1970. That’s how I got screwed predicting “Rise of the Planet of the Apes” over “Hugo” back in the day. So you can eliminate Star Wars and Ex Machina right away. I refuse to believe the Academy will think of “The Revenant” as a visual effects extravaganza. A win for “The Martian” would feel way too “been there done that” since both “Interstellar” and “Gravity” were the last two winners. The Academy’s alleged love for “Mad Max” should help it prevail here but unlike some years, this is a particularly tricky category to predict this year. My final tally would be The Revenant and Mad Max: Fury Road both with five wins. Makes sense to me. We'll see what happens.